Sometimes there are some multiple falls and trip-ups in the Running of the Bulls that can create pile-ups and crushes, which completely block the path of both runners and bulls coming up behind. This is by no means a habitual occurrence but it has happened from time to time down the years, especially at the entrance to the bull-ring on the final stretch. The narrow entrance to the arena is prone to creating pile-ups as the runners enter at a very fast speed and there are always a lot of falls and trip-ups here. When the pile-ups cause the entrance to be blocked, the bulls usually race over the fallen bodies, creating general havoc and distress. Sometimes, they turn back and race back out to the street, which is very dangerous for those runners coming behind. These are some of the most important pile-ups which have occurred down the years in the Running of the Bulls. 2013. 13th of July. The accidental opening of a wooden side gate to the arena caused a huge blockage of bodies which left 21 injured runners, two of them in a serious condition. 2008. 13th of July. One of the last classic pile-ups. At the Telefónica stretch leading into the bullring. There were no gorings here but a lot of runners suffered bruising and similar injuries. 2004. 12th of July. At the entrance to the stretch leading into the bullring. Some of the bulls race over the fallen bodies. Two of the bulls turn back. A chestnut-colored bull gored three runners, while one of the black bulls severely gored one of the best-known local runners, Julen Madina, causing him some serious injuries. 1993. 11th of July. At the end of Estafeta street there was a spectacular pile-up. Not for sixteen years had there been a similar situation. A black bull by the name of “Papelero” got trapped along with the runners and it had to be coaxed out again by the runners using their newspaper batons. 1987. 10th of July. At the end of Estafeta street there was a small pile-up. The Osborne bulls, coming up behind, eyed the fallen runners and one of these, a local runner by the name of Gaizka Aranguren, suffered a goring. 1977. 8th of July. At the entrance to the bullring. There were thirty five runners injured here and, one runner, Joaquín Esparza Sarasíbar, died. 1975. 9th of July. At the entrance to the bullring. When the pile-up formed, the bell-oxen stampeded over the fallen runners, but the pack of bulls turned back and entered the street again. When they were led back to the arena again, they charged through the blockage of runners, causing 16 injuries and one death, Gregorio Górriz. After this tragedy, City Hall decided to create some cat-flaps on the sides to allow fallen runners to crawl through. 1974. 8th of July. A pile-up just before the entrance to the bullring. 1972. 13th of July. Bulls from the Samuel Flores bull-ranch, when they faced a pile-up at the entrance to the bullring. There were 18 slightly injured runners. 1972. 7th of July. One runner, Miguel Ángel Vicente, receives a light goring, – just a puntazo– and some 22 others suffered from bruising and contusion. This pile-up blocked the entrance to the bullring and the bulls turned back out to the street. The gate at Espoz y Mina was open and the bulls raced back down as far as the fencing at the Bajada de Javier. When lead back up again, the bulls found the passageway free of obstacles and they entered the arena without more ado. The whole running of the bulls event took over 9 minutes. 1970. 8th of July. A pile-up formed at the passageway leading into the arena. Forty runners were injured, one of them seriously. Among the runners here was the matador from The USA, John Fulton, and Gerry Dawes. They can be seen in the image found at gerrydawesspain.com. 1960. 7th of July. In Estafeta street. A bull charged into the pile-up. There were 20 injured runners. 1957. 7th of July. Bulls from the Guardiola bull-ranch. The entrance to the bullring. One of the largest pile-ups in the history of the event. There were no gorings but several runners needed to be treated for suffocation. 1943. 7th of July. 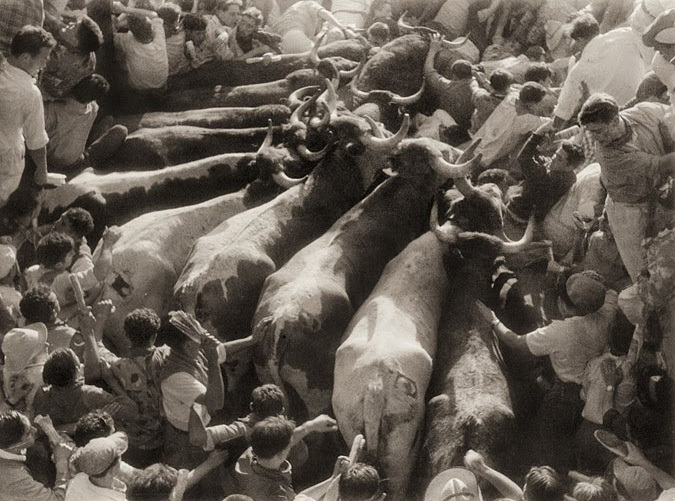 As the pile-up formed, the bulls came to a halt and it took three minutes before they started to run over the fallen bodies. 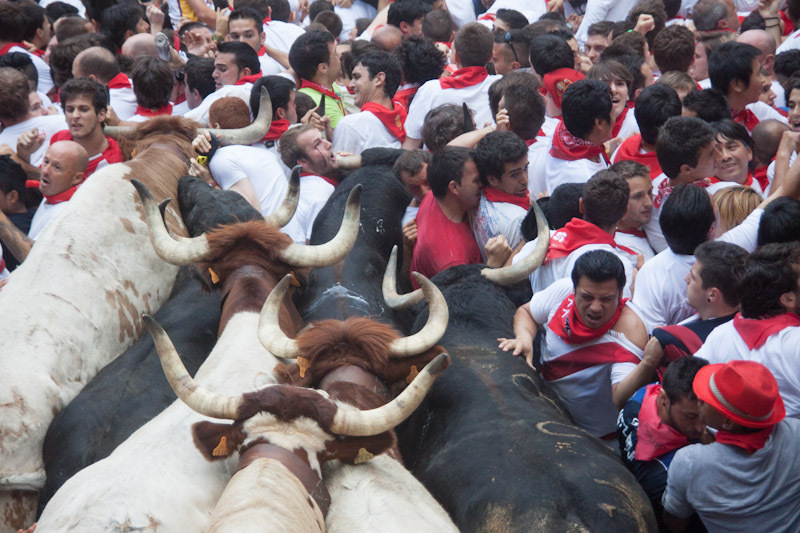 Other runners ran back out from the passageway, causing another pile-up at the entrance, thus creating the singular incident of having the bulls trapped in the middle of the two pile-ups. 1922. 7th of July. 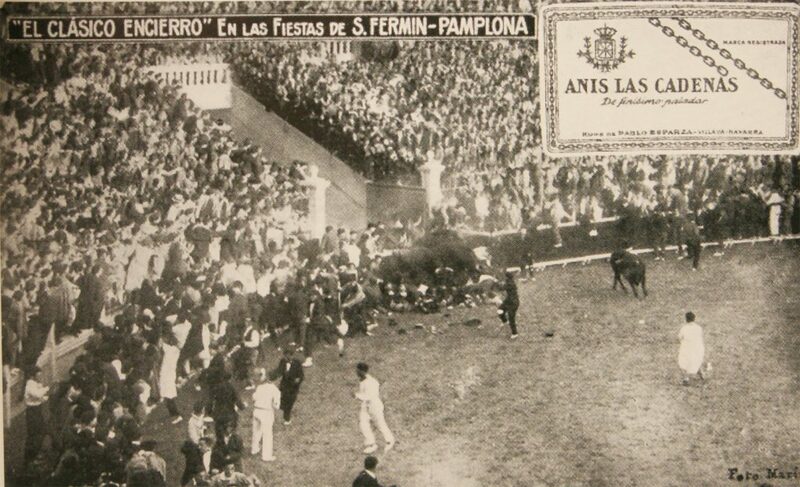 The inaugural day of the newly-built bullring with bulls from the Vicente Martínez bull-ranch. A pile-up was created in the passageway leading to the arena. The bulls were urged forward by the bull-minders from behind as they beat them with their rods and the bulls passed over the human mass of bodies and entered the arena. About a hundred runners suffered from diverse bruising and contusion.